My phone was acting up so I decided to do a full reset. With all the apps I have installed, I made sure a super fast internet connection was available. I also use Nova Launcher and reinstalled the backup so all my folders were right back when I started. We’ll see if the performance improves. Very windy days are predicted for the first two rounds of The Masters. I love it. 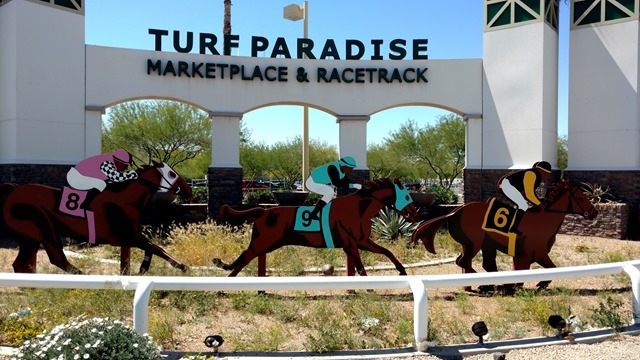 Next to the Sam’s Club is the entrance to Turf Paradise. A local track that attracted a caddie or two when me played Moon Valley. This entry was posted on Tuesday, April 4th, 2017 at 3:54 pm and is filed under Uncategorized. You can follow any responses to this entry through the RSS 2.0 feed. You can leave a response, or trackback from your own site.